Adlabs Aquamagica Water Park has 12 water rides and water attractions, and is one of India’s Best Water Parks. Aquamagica Water Park is located next to Imagica at Khalapur (Khopoli), and is part of the complex that houses Adlabs Imagica Theme Park and Adlabs Hotel. All visitors going on water rides must wear synthetic swimwear made of nylon or polyester. Visitors are expected to dress modestly, so as not to make other visitors uncomfortable. Skimpy swimwear, transparent swimwear, underwear, jewelry, swimwear with exposed metals (buckles, zips, fasteners, etc) are NOT allowed. Only footwear such as Rubber clippers, Crocs, Flip flops are allowed. Sneakers, shoes, sandals, etc are not allowed inside the park. Women can wear Swim wear and Tights made of nylon or polyester. Women can wear T-Shirts, provided they are made of nylon or polyester. Full body swim suits are also allowed. Saris, Salwars, Jeans, Cotton shorts, Cotton T-shirts, Kurta, etc are not allowed. Swim caps are allowed, though not mandatory. V-Shaped or U-Shaped swimming suits and trunks are NOT allowed, even though they are allowed in most swimming pools. Swimwear and Beachwear made of nylon or polyester is allowed. Special swim diapers are allowed. Regular Diapers are NOT allowed. Appropriate clothes for Adlabs Aquamagica Water Park can be purchased at stores inside Aquaimagica. Do remember to get your towels and at least one (if not more) change of clothes. Towels can be rented for Rs 100. Lockers are available on rent (Rs 150). Children below 3 years are free. Senior Citizens are those over 65 years of age. AC Shuttle Service is available from Pune, Hinjewadi, Lonavala, Mumbai’s Western and Eastern Suburbs, Thane, Navi Mumbai. Shuttle cost additional Rs 500 per person. Please visit Adlabs Imagica Water Park website for details. Aquamagica and Imagica offer a free pickup from Khapoli Railway station at 10:15 am. At present there is no combined ticket for Aquamagica Water Park and Adlabs Imagica Theme Park. Once the 4 star Imagica Hotel starts operation, it is expected that there will be combined tickets for staying and visiting the Adlabs Water Park (Aquamagica) and the Entertainment Theme Park (Imagica). Adlabs Imagica’s Water Park, “Aquamagica” is open throughout the year. Aquamiagica Water Park is next to Adlabs Imagica, which is at Khalapur (Khopoli), between Mumbai and Pune. 30/31, Sangdewadi, Khopoli-Pali Road, State Highway 92, Off Mumbai-Pune Express Way, Khalapur, Khopoli, Maharashtra 410203. Take the Mumbai to Pune Expressway. At the Khalapur Toll Naka (2nd Toll Naka) take the first left at the Khopoli exit. Distance from the start of the Mumbai Pune Express way, at Kalamboli (McDonald’s), to Khalapur/Khapoli exit, is 33.5 Km. Take the overhead bridge and go south towards Pali Road. After the bridge, take the left turn towards Pali Road. To reach Aquamiagica Water Park travel 3.7 Km on the “Khopoli Pali” Road. Imagica and Aquamagica will be visible from a distance. Take the Mumbai to Pune Expressway. Take a U-turn just before the Khalapur Toll Naka. Take the first left at the Khopoli exit. To reach Adlabs Imagica Water Park travel 3.7 Km on the “Khopoli Pali” Road. Imagica and Aquamagica will be visible from a distance. The 7:50 am Local train from CST (VT) travels via Dadar (8:03 am), Kurla (8:10 am), Thane (8:28 am), Karjat (9:43) and reach Khopoli Station at 10:08 am. Adlab’s Aquamiagica has a free Shuttle service from Khapoli Station to Aquamiagica, which leaves at 10:15 am. The return train from Khopoli is at 5:57 pm. Auto-rickshaws, taxis and local buses are also available from Khopoli Station to Imagica and Aquamagica. PLEASE NOTE: Many of the water rides are suitable only for teenagers and adults. Many of the water attractions have a minimum weight restriction of 48 Kg (usually age 13/14 and above) and height restriction of 1.2 meters (usually age 7 and above). Listed below are the water rides and attractions at Adlabs Aquamagica Water Park, along with their weight and height restrictions. There are 12 water rides and attractions spread over 20 acres. The Pirate Bay: Water toys, Mini Slides, tubes in a shallow pool of water. This is an ideal way for young children to spend hours in the water. Age, Height and Weight: No age, height and weight restrictions. Floatsa: Lay back on a float and have a relaxing ride along the Lazy River. Age and Weight: No age and weight restrictions. Wacky Wavess: Wave pool, with gentle waves one would experience on the beach. Loopy Woopy: 39 feet free fall in a transparent tube. Weight Restriction: Min 48 Kg and Max 136 Kg. Zip Zap Zoom: First half of this mat ride is along a tube and the second half is down a large slide. Weight Restriction: Max 120 Kg. Yell-O! 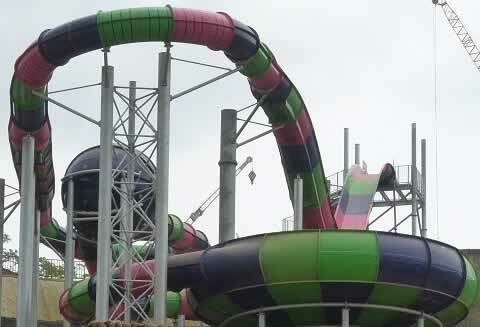 : High speed water slide ride through twists and turns. Swirl Whirl: Exciting twists and turns in a giant funnel. Splash: Water slide with turns and bumps. 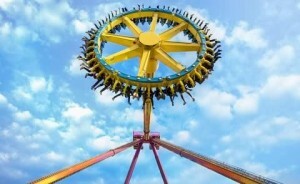 Boomeranggo: Experience weightlessness in this ride which drops and raises the rider. Soakerz: This is a family water ride in a raft. The Screamer: Thrill water ride in which riders are shaken with twists, turns and oscillations. Raftaastic! : A family water ride with drops and turns. Hygiene levels are maintained at Aquamagica by a state of the art water filtration system. Adlabs Aquamagica’s water requirement is taken care by a 260 million liter rain water harvesting reservoir. Adlabs Aquamagica has made provision to internally take care of its water requirements.